How about a murder song tonight folks? 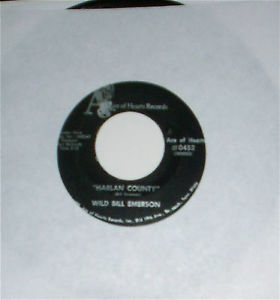 Wayne Kemp cut a terrific version of this for MCA, but here’s the original, by its author “Wild” Bill Emerson, on the Ace of Hearts label. There were at least three musical Bill Emersons: the renowned virtuoso bluegrass banjo player, the R&B guy who cut a few sides for Sun, and this fellow. Dig around on the web a little, and you will see the bluegrass Bill Emerson and Wild Bill often lumped together, confused and conflated, but they are different dudes. I remember reading a short bio of Wild Bill a while back that said he got his start in Detroit during the rockabilly explosion of the 50s; that’s where he got the “Wild” nickname, he had a reputation for crazed dancing-on-the-tables performances. But like a lot of those guys, after that initial burst of rock & roll energy dissipated he simmered down and started cutting country in the mid-60s. He made several nice sides for Nashville-based Topic Records circa 1965 (I may post one or two of those sometime), went quiet for a few years, then had a flurry of releases on Ace of Hearts beginning in 1972. He recorded steadily thereafter for about a decade, so if you like this there is more out there to dig for. But be careful: no man’s ever lived long enough to tell about runnin’ his woman around. This entry was posted in Tom's Record Room by Tom. Bookmark the permalink.